Summer is definitely on its way out. Technically, it IS fall, but I've been hanging on and calling it 'late summer'. Today is the first day that it's truly hit me, with temps in the mid-50s, that fall has crept in to stay. My flipflops are soon to be replaced with socks and shoes--a switch that, to anyone who knows me, marks my final farewell to summer. And believe me, I don't ditch those flip-flops until it's so cold I can't feel my toes while wearing them. My goodbye is long and lingering. We have had so much fun this summer--swimming, swinging, climbing, running--all the typical outdoor activity. We have also loved checking on the garden every single day. The kids took such an interest in everything about the garden, just as I had hoped; in fact, they would not let a day go by without reminding ME that we should go and check on things. 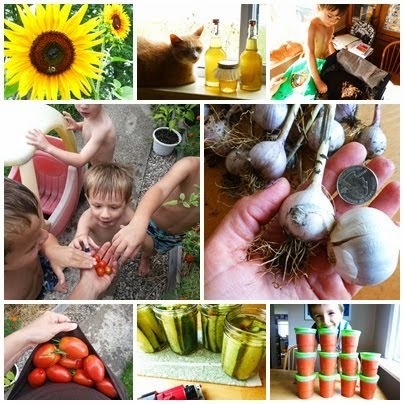 So many potential blog posts came and went without being written--but being outside with the garden often trumped coming in to the computer to actually write about it. . We learned an incredible amount for our first year in the garden! When it's all written out, it seems impressive! I'm proud of the efforts the kids made to keep the garden thriving, giving us all this food! BUT HEY! We are not quitting for the season, yet. According to several sources I've checked, including an article I just finished reading in this regional gardening publication, right now is the perfect time to be growing beets, broccoli, cauliflower, collards, kale, kohlrabi, lettuce, onions, peas, radishes, spinach and turnips. Last week we tore out the spent green bean plants and pushed a bunch of peas into the soil, hoping for a fall harvest. We put some lettuce seeds, which, like the peas, we had leftover from our spring planting (our spring lettuce never succeeded), into the garden as well. A couple weeks ago, we took out our trusty mini-greenhouse and got some caggabe and radish seeds planted. I wanted to have them established so that we could transplant them into the garden, perhpas giving them a headstart, a hardier beginning. Peas and lettuce supposedly do better NOT being tranplanted, which is why they went straight to the garden soil. Cabbage and radish (along with some various flowers) were the only seeds I could find, after searching at least 5 stores...apparently the gardeners who plant fall crops plan ahead and buy the seeds in the spring! I was so disappointed, especially after reading about all that variety we COULD be attempting to grow for fall. Everyone has to start somewhere, and I suppose the cabbage and radishes will be our perfect first attempt! Only a few days later, we had the excitement of green popping out! Here are the fall babies, just a week after sowing them in the greenhouse! As the temps continue to lower and fall becomes more bitter, we will have to learn ways to keep our fall harvest safe and thriving. I am already in the process of figuring out some sort of cold frame (like a winter greenhouse) for the garden. I am eager to see if we can have some success at growing food before heavy frosts and blankets of snow replace the all the green that is still hanging on in the garden!